Automatic updates has really helped XP, and subsequently 2003 and Vista, stay on top of the mounting attacks directed against PC users. Whenever I am called upon by relatives and friends to fix their PC's this is the first gift I always give them. My windows workstation is still using XP I have opted not to update to Vista, even though I have a copy sitting in my cupboard, because there remains some continuing compatibility issues with some of the Music software I use. Due to the critical nature of this workstation I am strict about not letting it connect to the Internet on a regular basis. I try to conduct the updates once a month to ensure that everything is as it should be. I noticed that there have been several non critical updates that I have had queued for a while, and upon further investigation I realized that they have been failing. All the failures were related to the .NET framework and their associated service packs. So I am thinking that there maybe an issue with the Automatic Updates delivery system and so I proceed to download the .NET Framework SP (1.1 and 2.0) in the hope to circumvent the problem. I end up being give this useless error message to the left which tells me absolutely nothing. Seriously what were they expecting me to glean from this, what is SL4.tmp? how does it relate to my problem? Is the file corrupted or missing? Where is it supposed to be? All the bits of useful information I was hoping for did not seem to be given when the failure occurred. At this point I am forced to perform a Google search on it but I come up with nothing! My next step is to try uninstalling the entire framework both 2.0 and 1.1, but unfortunately neither the remove or repair options for either framework appears to be functional. This new error appears related to DOTNETFX.MSI, which does not appear to exist on my machine ... aaargh!! 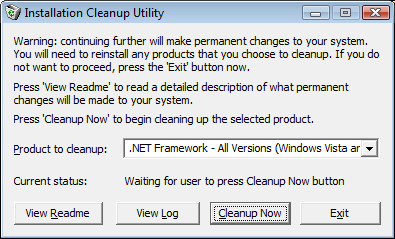 I performed a series of searches on the topic of .NET installation errors and come across the blog of Aaron Stebner who has developed a tool for cleaning up installations of the .NET framework (called the Installation Cleanup Utility) . He clearly indicates on his blog that this should be considered a last resort, and that is certainly the position I found myself in, so I took the leap of faith and downloaded the tool. Well it worked! 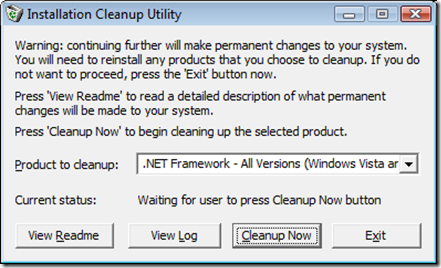 The Cleanup Utility is easy to use and allows you to select which framework you are having problems with, or select them all. It produces a log file indicating what changes were made (this may include registry updates so you will want to make a back up before proceeding). All in all it took about 20 seconds to fix the problem at which point all the Automatic updates started to run successfully! Another useful tool that is free!! You should try to perform a standard uninstall first. This tool is not designed as a replacement for uninstall, but rather as a last resort for cases where uninstall or repair did not succeed for unusual reasons.